There is a new Frenzy Character (Urahara with Crystal and Coin Drop) that I forgot to talk about. Loving what KLab have been doing to the events by adding Event Clear Points, been farming the Four Battles event for all the Brave Souls Summon Tickets! Is there no midmonth banner? Nope, we got a Mind Attribute filler summons instead. Probably a good thing so people can save for the Anniversary! RNG is a cruel mistress. I need green accessories(so I can supe up my characters linked to TYBW ichigo) and I get red. You don't get stat boosts from accessories linked to characters you are using as soul links. I'd run the Four Battles event for a chance to get x3 Premium Accessory Tickets (and the Brave Souls Summon Tickets) but the Kon's Calamity event is also good since it has x5 Premium Accessory Tickets in the lottery and a Brave Souls Accessory Ticket every 50 soul tickets used. Darn. I just got to where I have enough link slot potions to have actually upgraded three of my links to level 3 with one being level 4. I figured link slots would be the only reason you’d be crazy enough to use one of those accessories which reduce sp to 0. Strangely, I’ve done close to 30x10 premium ticket pulls (90% red and almost always for a character type I do not have). I’ve accumulated a ton over the past 3 months. Always getting premium tickets when I want soul tickets or brave summons tickets. The brave ticket event has been awesome for me. I’ve accumulated many brave souls tickets. 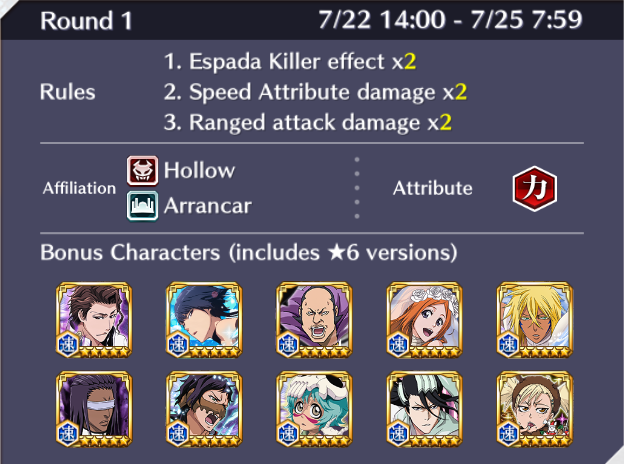 Most people use chappies on characters with Flurry and Poise for PVP (TYBW Unohana, One-Armed Yama, and TLA Kenpachi) because it makes them obscenely strong or just on characters with high ATK and skills to not really need SP. That’s some terrible accessory luck! If they repeat what happened last anniversary there should be events that drop specific attribute accessory tickets! Yeah I always try to farm the Brave Souls Summon Ticket events for the chance to get new characters! These new accessories aren’t the greatest but I already spent 3000 premium accessory tickets trying to grt the facts exclusive ones, ended up with 2 speed increases and 1 melee guard resistance. Started playing the game on an iPhone 6S and the performance is so much better than on my iPhone 5S, too bad the 6S only has 16GB but I can make it work! It looks like the Anniversary character was unveiled a bit early. Oops. 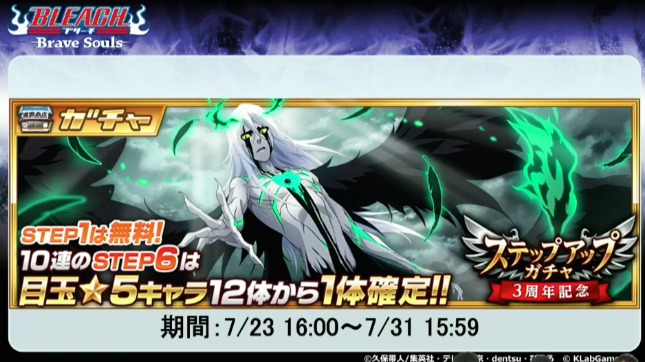 It looks to be a Hogyoku-fused Ulquiorra. Same. I'll likely do a full step up for Round One (if they have it and the rates are decent), but the rest is being saved for TYBW Vol. 4. Can't wait. Many tears will be shed. They'll probably fill her slot with another Ichigo. Most important announcement. He’s gonna be broken most likely. 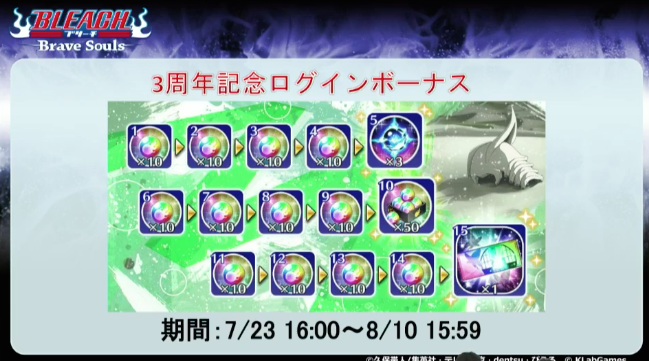 Also, new soul tree stuff for enhancing speed I believe. Oh there’s also gonna be some sort of resurrect mechanic added. They didn't really explain that all to well but it seems like it's going to be a level cap raise or the fabled 7* as it's to help character growth. THe name resurrect makes me think you’ll probably be able to reset back to level 1 and base soul tree in return for a probably small boost to base stats. This anniversary stream kind of let me down. No real surprises, since Ulquiorra was leaked ahead of time, and even if he wasn't a lot of people (myself included) expected him anyway. The biggest disappointment for me was lack of TYBW Vol. 4 news. I get why they didn't do it, since it would likely overshadow the new Ulquiorra, but that didn't stop them last year with Lunar Ichigo. 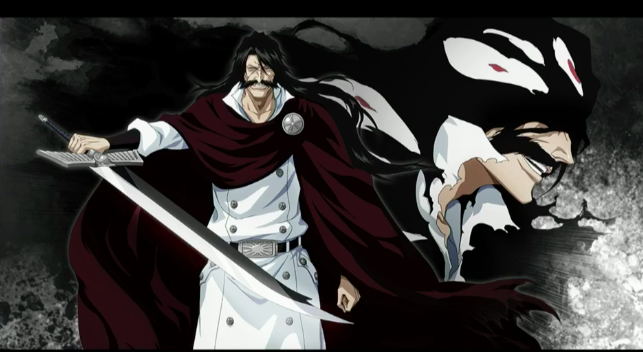 Yhwach is cool, but I wanted my Yoruichi! There's always a chance they might stealth release it right after the first round banner, but if not, I guess I'll just continue saving. 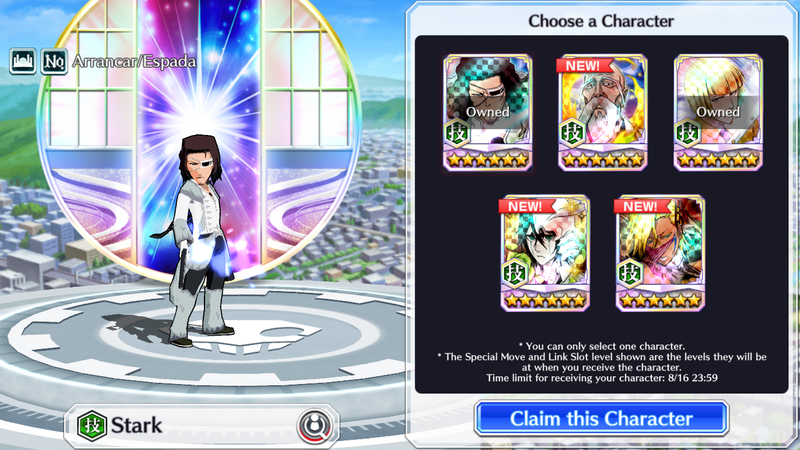 I might pull more than I expected to for Ulquiorra if he's good, but ONLY if the filler pool is good. If it's not, I won't bother. 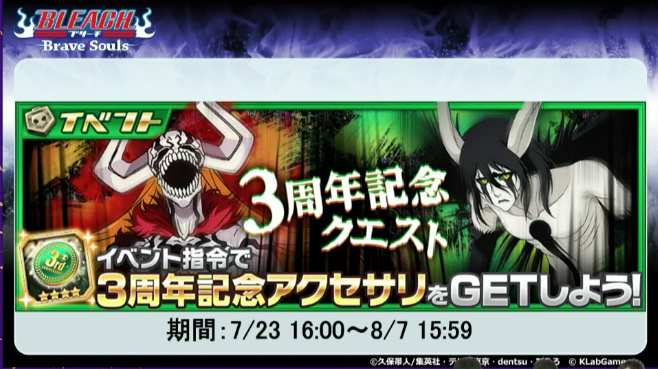 Ideally, they'll make it a step-up with a guaranteed Ulquiorra at the final step (other gacha games do something similar), but I have a feeling this won't happen unfortunately. 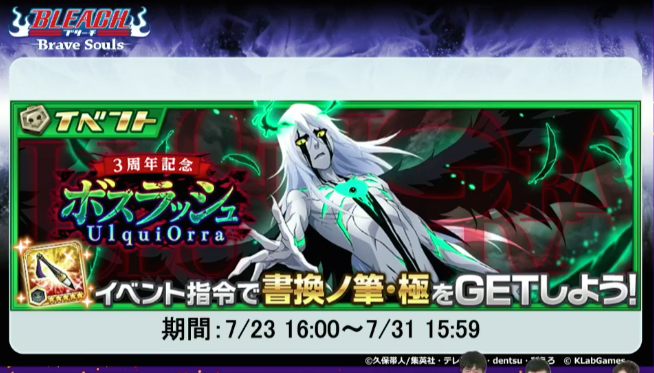 The new Ulquiorra is power-attribute and seems pretty powerful. Weaken, Frenzy, Charged Attack, No Affiliation Killer, SAD +25%, Poise, you name it. Filler characters re great, too. So many useful ones. I'll definitely go six steps for the guarantee, but probably not more than that. It depends on how things go. Wait, apparently these aren't the only 5* on this banner, they're the only "featured" ones. 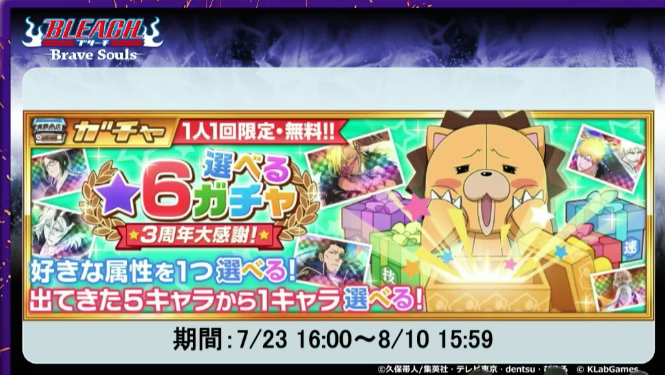 It's possible to pull all of the other 5* from the common pool through this banner, albeit at a supposed lower rate. Never mind, apparently it's still a 6% chance for a featured character (at the later steps), it's just if you don't get one of those, you at least have a chance to grab another random 5* character. So, in theory, it should be easier to get multiple 5* multi's, with the same chance for one of the banner/filler characters. Ulquiorra gameplay. He looks to be really good, really nice animations and super fast attack string. Seems like the rates are improved, Step 2 is 4% at least. I have none of the "featured" characters so I might just pull the singles at least. 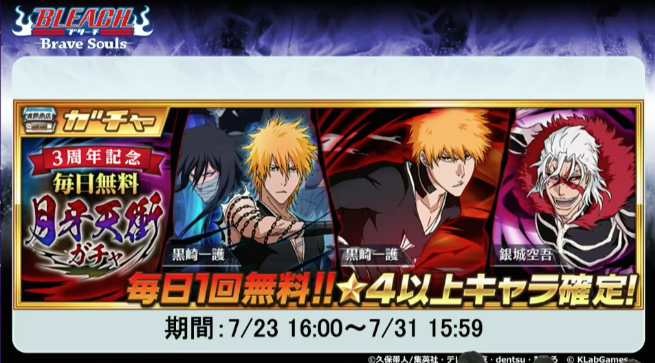 Disappointed at the disparity between Global and JP news though, JP has detailed 6* pull, Getsuga Gacha, 3rd Anniversary Quest, Ulquiorra Boss Rush, Anniversary Ticket, Intensive Course, Frenzy Intensive, and much more while Global just gets the Step Ups Notice. I saw it after the daily reset so props to KLab for that, though they should really update at the same time. Excited for the Droplet Trials and more importantly the x5 Soul Ticket on character raids! I’m not really feeling ulquiorra yet. Think I’m going to do the steps till the guaranteed 5 star and save for Yoruichi after that. I can see manga round 4 being in round 2 of anniversary, or that’s what I’m hoping for. This guild quest is pretty easy if you have TYBW Shunsui! It’s also super easy with TYBW Rukia. Yeah there are plenty that are good but I feel like Shunsui is the safest to use, Rukia does beat his special though by having freeze. So what’s everybodys orb count at before step ups? I'm at 15k, and I still have at least ten 6* characters I can max for orbs. I won't go beyond Step 6 (MAYBE Step 7, I'll see) for round one, though. If TYBW Vol. 4 (and Yoruichi) are in round two, as many expect, I want to have enough orbs to hopefully get Yoruichi (assuming she's in Vol. 4). 9K after throwing 2K orbs at TYBW Ichigo who still eludes me. I did get three Unohana's though so...yeah. 2K but mostly because I wasted so many trying to get SS orihime for that armor adding ability. I got 4 Nells and 3 Rirukas. My lucks been crap after pulling TYBW Unohona, TYBW Ichigo, TYBW Rukia, and TYBW Renji. I only have I think 50... I'm always low on orbs. And my phone's performance as of late has gotten worse (I get multiple force closes on apps a day), so I haven't really been playing much again. The 1, 2, and 3 punch of TYBW Ichigo, Hellverse Ichigo, and Swimsuit Orihime used up a fair bit of my orbs so I'm only at 5k. The game became such a chore to play on my iPhone 5S because of this, I started using my sister's iPhone 6S for it and it's so much better. Anyway, I did my six steps. Funnily enough, going in I was going to pick Tech as my attribute in the choose-your-own promotion, since I wanted Soi Fon, Yamamoto or Aizen. The ONLY new characters I got in those six steps were precisely those three, as well as a dupe Mind Soi Fon and two dupe White Zangetsu. As much as I'd like to get Ulquiorra, since the rest of the filler pool doesn't interest me, I'll probably stop here. I'm not sure which attribute to choose now. Maybe Speed, just because I want to try for VD Yoruichi. Wow, nice selection of characters, Hypno! No brainer goingm with Halibel, though. I have her, she's great. At least Ulquiorra doesn't seem to be limited so he'll return someday! This is why I did the step up's before choosing my attribute. 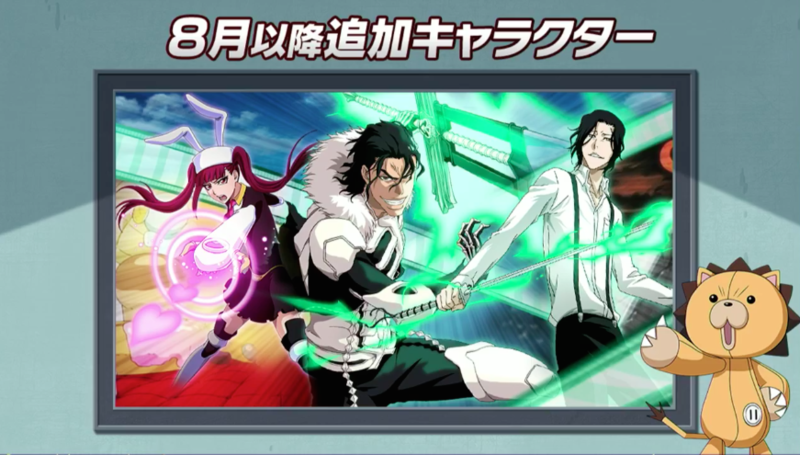 If I had went with Tech and then got a dupe of Soi Fon/Yamamoto/Aizen, I would cry. Then again, they are great links. Best of luck to you on your pulls, should you decide to do more! I was looking at the lists for attributes, and I've been blessed in more than a few areas so I don't really need any of the elements now. I know Speed might technically be the weakest choice, but they have a handful of characters I like (Christmas Halibel, VD Yoruichi, Anniversary Ichigo, Past Lisa, and Parasol Nanao. The rest of the ones in the list I'd want I already have. I've got basically all of the ones from Power and Tech that I'd ever want (although Christmas Ururu would be great), and I already have a handful of the strong characters from Mind/Heart too (TLA/TT Renji, White Zangetsu, Barragan, SS Riruka, Past Mashiro, etc.). It's a free choice, so I guess it doesn't really matter. Worried about getting a Yammy on Speed, though. If anything I'm going to just pick Izuru and call it a day but I'm looking for suggestions on who the best of this bunch is.